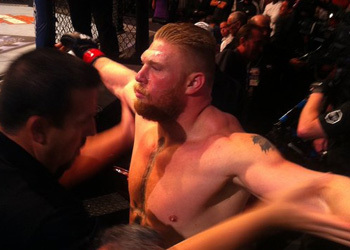 After “Strikeforce: Diaz vs. Daley” wrapped shop this past Saturday, the sport of MMA has embarked on a bit of a lull. While there will be plenty of “UFC 129: St-Pierre vs. Shields” pre-fight hoopla available, as well as some thrilling Bellator action, the April 30th extravaganza in Toronto, Canada marks the only major mixed martial arts show over the next 44 days. Thankfully for fight fans, the UFC, along with their new little brothers, will come storming back to kick off the summer in style. Beginning with “UFC 130: Edgar vs. Maynard III” on May 28th, fanboys will be treated to six consecutive weekends of MMA excitement. The cards will include a handful of spectacular scraps, four Strikeforce Heavyweight Grand Prix participants, three non-pay-per-view broadcasts, two thrilling championship affairs and a partridge in a pear tree.